1) Cut steak diagonally across the grain into 16 thin slices. Put steak, soy sauce, 1 tablespoon rice wine vinegar, mirin, and sesame oil in large zip lock bag and marinate at least 10 min, preferably 1-2 hours. 2) Remove steak from marinade, put marinade to the side to reserve for later. 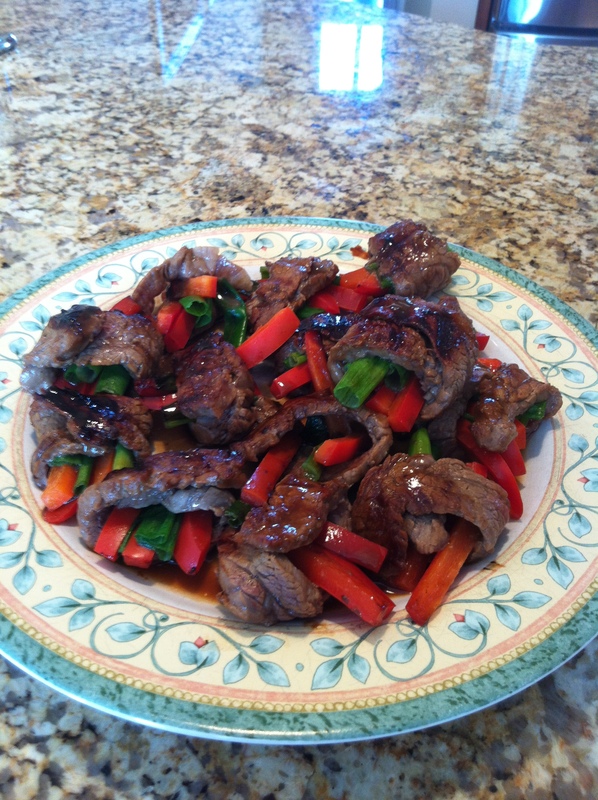 Place 1 steak slice on a cutting board and place 3 pieces of green onion and 3 pieces of red pepper on steak then roll. Place completed beef rolls on baking sheet. 3) Coat grill pan with cooking spray then heat pan over medium-high heat. Place beef rolls in pan, seem side down and cook for 3 min. Then turn and cook for an additional 3 minutes.